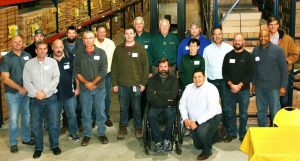 Brock Engineering concluded its 1-1/2-day training school in Underground Gas Storage for Field Supervisors and Operators today in Kalamazoo, Michigan. Sixteen participants from across the country participated in the school. The school covered the topics of well construction, optimization and impairment, well and field integrity, wireline operations, abnormal operating conditions, regulatory overview and risk management. In a post-class survey of the participants all said that the school was worth their time and they would be likely to recommend it to others. Brock Engineering, LLC is a professional engineering consulting firm that provides petroleum engineering and gas storage engineering consulting services and training to the energy industry. We have a broad-based background in a diversity of project types and strive to deliver the best quality solutions. We use the most current technology to be able to respond to our clients’ needs. For more information, visit www.brockengineeringllc.com.